I'm also going to send you a picture of the maximum-security state prison in Marquette, which was also built of local sandstone and has a castle-like look to it. The building you see at the prison is actually the administration building. It was built in the 1880s and I believe is on the register of historic places (at least for the state). 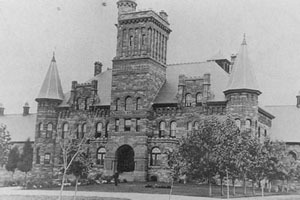 The Marquette Branch Prison was built between 1895 and 1899 near the banks of the Carp River and the shore of Lake Superior in south Marquette. The structure cost $150,000, and materials included sandstone from quarries in south Marquette and Portage Entry (walls and trim), slate from Huron Bay (roof) and copper from the Keweenaw Peninsula (decoration). Additional buildings were added over the years, and the prison was desingated a maximum-security institution (the most violent and hardened criminals in the state were incarcerated there), but the original structure remains in place (now used as the administration building), along with the sunken gardens that were constructed in 1922. (Information and photos derived from Marquette Then and Now: Fascinating Vignettes of Marquette's Progress to the Present, by Sonny Longtine and Laverne Chappell, North Shore Publications, 1999, p. 42-43). A special thanks to Amy Jentoft for sending in the information and photo.